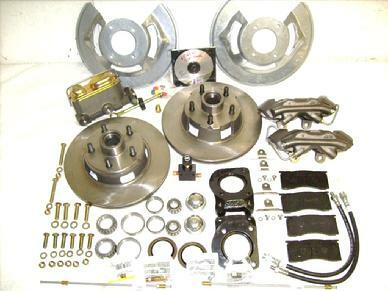 1964 1965 1966 1967 MUSTANG FAIRLANE COMET FALCON, and 1967 MUSTANG COUGAR FACTORY STYLE 4 PISTON DISC BRAKE SETUP, With SSBC Components. Please specify year some we can select Correct Calipers/Hoses. Factory Stock 11 19/64" Rotors---Bigger Stopping ability than Granada!! This is just what your 65 66 67 Would have rolled off the assembly line with had it had Disc Brakes from the Factory. (Will not Fit 65 66 6 Cylinder Spindles----WILL FIT 67, 68, 69 6 Cylinder Spindles. Conversion includes everything on the bottom end to apply, bolt on EXACT, Correct 4 Piston Disc Brakes, Plus a Brand New Raybestos Dual Bowl Disc Master, AND a Line kit to install. Comes with a 80 Picture CD to assist, and guide you, VERY Simple application. Also a narative, and Diaghrams. Every Piece is Brand New!!! All Quality Parts. BW Kansas Calipers with Nickel Chrome Pistons, Stainless Steel Rattle Clips, Stainless Steel Clip Bolts, Raybestos Pads. 20 Years from now ANY Factory Style parts bought at any Auto Parts will fit this setup---GUARANTEED! No Quessing what you put on Years ago. If you will be needing a Power Booster, see our other items, or call for a Package Pricing. These will fit on all 68 69 MUSTANG FAIRLANE COMET FALCON Drum Brake Spindles, 6 Cylinder, and V8, Giving you the BIG Stopping Power of the 4 Piston K/H Style Disc Brakes, With SSBC Components. Factory Stock 11 19/64" Rotors---Bigger Stopping ability than the SMALLER Granada!! Same Brake as used on all BB 67 Mustangs, Both Shelby Super Snakes, ALL Shelbys in 67. Conversion includes everything on the bottom end to apply, bolt on EXACT, Correct 4 Piston Disc Brakes, Plus a Brand New Raybestos Dual Bowl Master, and a Line Kit with Fitting to install. Fenco/BW Kansas Calipers with Nickel Chrome Pistons, Stainless Steel Rattle Clips, Stainless Steel Clip Bolts, Raybestos Pads.